Brisbane Roar Youth ended Sunshine Coast FC’s run of four straight wins, prevailing 3-1 at Perry Park on Saturday. Young Roar’s Nicholas D’Agostino cancelled out Brady Cronks opener for Fire, before Sam Sibatuara and Mitchell Hore secured the points in the second half. The hosts came into the match following a four-week lay-off from competitive football and proved rusty in the opening exchanges against the in-form Fire. The visitors took advantage just inside the quarter hour when Cronk struck from outside the area following a partially cleared corner. Possession was strongly contested through-out the half before Sibatuara delivered Young Roar’s first shot on target midway through the half. Fire continued to threaten as Kaine Frew sent an attempt just over the crossbar shortly after before captain Reyze Kelly saw his shot blocked just after the half hour. However, Young Roar drew level just before the interval when D’Agostino dribbled across the box and slotted home a left-footed strike. 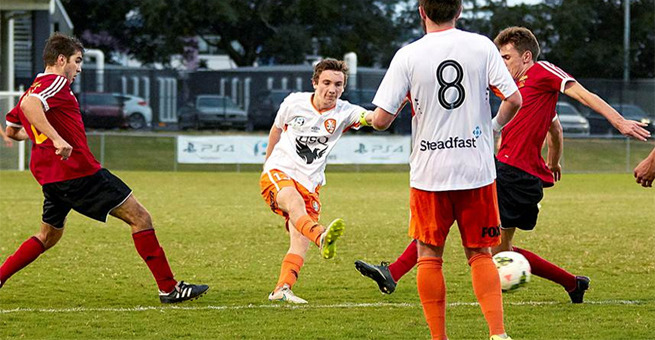 Fire started the second stanza strongly and forced a pair of saves from Young Roar goalkeeper Denver Crickmore. However, Young Roar sensationally took the lead on 49 minutes as Sibatuara cut inside and delivered a left-footed shot into the bottom corner of the goal. Young Roar increasingly took control and doubled their advantage just after the hour when Hore slid home the finish from Luke Pavlou’s cross. The hosts were untroubled for the remainder of the contest, however there was late drama as Fire substitute Louis Shephard was shown a straight red card after throwing the ball in the direction of an opponent. The result lifts Young Roar to seventh in the league with games in hand over their rivals above. Speaking post-match, Hore expressed his delight at wearing the captain’s arm band for the first time and guiding his team to a win. “I’m learning to take more responsibility and the boys played well and got the result - it was a good all round performance,” he said. Fire player-coach Paul Arnison was philosophical about the result but lamented his side’s lack of composure after finishing the match with ten men for a second straight week. “That’s two in two weeks. You can’t afford it when you’re getting frustrated and things aren’t going your way, but I’ve been there as a player myself and done it myself and I know it feels,” he said.